Moral of the story: as showed on the last figure, most of the traffic from the core protocol is related with window management, window state changes and notifications of positioning for clients. 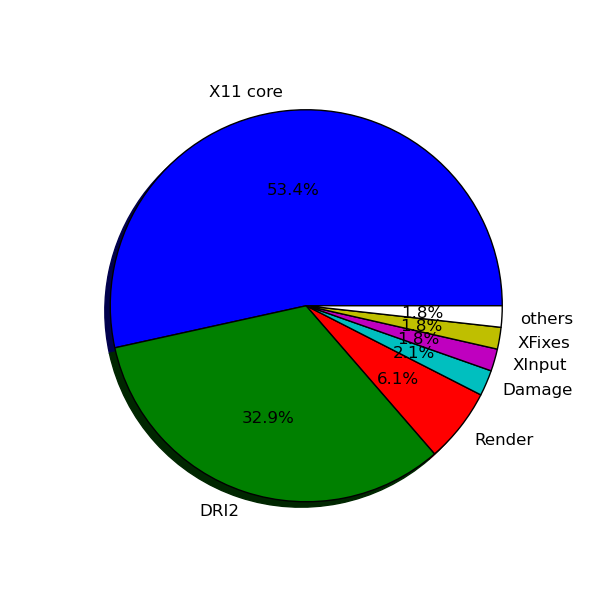 Actual drawing doesn’t happen on the core X11 at all. Everything goes through GL, GLES and similar APIs where DRI2 manages in some way them. And well, XRender is something to be deprecated soon on modern UIs. Its big slice part there is due a bug on Qt for not proper disabling glyphs for font rendering still. 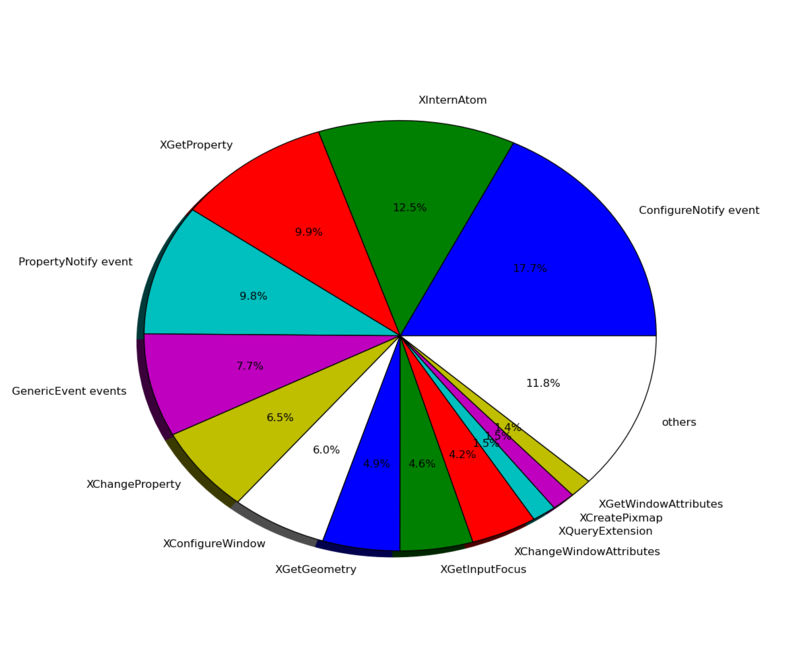 Another interesting fact (not on those figures) is that compositor manager is taking ~15% of the total interaction with X server – so then again, not big news for us. This doesn’t necessarily need to use the recent Erkki and Rami’s XRes additions for doing client tracking in the server side, but for who likes to hack on the server side, it’s quite easy to do. The hack I’ve done with Pauli’s help and using XRes version 1.2 is on this branch. The current implementation of X Window System relies in a signal scheme to manage the input event coming from hardware devices. This scheme frequently get blocked when lot of IO is occurring (for instance, when the process is swapping in/out). Get blocked means for instance a jumping cursor on the screen and in GUI is always desirable to prioritize the system responsiveness for end users. The human/computer interface should be smooth and this is the most user visible aspect of a system. Besides the need for improvement in system responsiveness, the current design of the event stream has some oddities, probably due historical reasons, such as the cursor update done in user-space or the huge path that takes to draw the cursor instead just connect the mouse hardware directly with the cursor position update in-kernel. Moreover there is no fundamental reason to input drivers be dependent of DDX part of the X server. Therefore a design of the input subsystem must be carefully redone to improve such issues. Our project try to solve all this problems. In summary the goal is: to get a path from hardware input event to client delivery that cannot be blocked by rendering or IO operations, meaning we always have very low latency on input events. Moreover, a redesign of such event stream could improve the overall X graphics stack, which must be considered as well. Basically 1. and 2. tries to solve the issue of blocking signals and 3. would be a completely redesign in input infrastructure. Anyway, the 3. strategy would impact in 1. and 2. but these could be implemented in parallel with the third strategy. The following sections details each strategy. Strategy 1 does not uses a signal handler anymore to wake up the event generation code. It simply poll for device’s socket and giving that this code is under a separate thread this is a win for the CPUs. With the separate thread taking care only the input code, it was expected that the cursor footprint always lived on resident memory when the mouse stills in movement. Unfortunately this was not true. For some reason it swaps back to disk. Maybe some scheduler adjusts would help here. A memory lock scheme was tried to do lock the cursor footprint always in physical memory without success. With this model the first and the second thread become not so tied and given that we’re using non blocking fds to wake up each thread (through a pipe), CPU “enjoys” the effect of threads. For instance, under heavy drawing primitives only thread #3 would wake up. We had a proof-of-concept of this last model and it workish (occasionally seeing some segfaults probably due of some critical regions we forgot to lock – now the only mutex that exists is inside the server queue of events). It’s hard to imagine other threaded models mainly because the way X deals with clients are very tied in every piece of the server and it would require a lot of mutexes. For sure this strategy is the most shocking one :) The idea is to connect the mouse hardware directly to the cursor position update function, all inside kernel. We’d then rewrite the event stream from the pointer device to an absolute position. Transform the relative mouse motion into an absolute screen position seems to be not that complicated, but this strategy would involve acceleration and cursor limits inside kernel as well (the current implementation of accel deals with floats, so we would have to adapt it to live in kernel). It is a _very_ _large_ amount of codification. It would require changes to the X server, DDX driver and its corresponding kernel DRM drivers, drm library and kernel input drivers. A mini-input driver *inside* drm is also needed. We would add complexities of the connection between input device and output device to the kernel (in my proof-of-concept implementation evdev is dependent of drm. Yeah, really weird world). Moreover, we would have to avoid somehow two differents sets of the exact same code in different contexts in the case of sw cursors (think MPX). It’s a completely redesign. Things would have to go incrementally. But why this strategy? Well, this would solve all the current issues with input latency. For instance with the current design of the kernel modesetting – which seems the future – the cursor is jumping a lot, much more than with current implementation. Try to call a xrandr instance and move the mouse with kernel modesetting. xrandr will do DDC communication which will blocked X in the kernel. So with the handling and update of the cursor inside the kernel all would work fine (and my proof-of-concept already showed this). Moreover, I believe the current implementation remained until now due historical reasons. Ultrix systems placed the entire input subsystem in the kernel. What is the problem to do this in Linux (and others) as well (besides massive codification)? and non-dri drivers? Should we forget them?